When in London a couple weeks ago, getting prepped for the Fun-da-mental – Taqwacore gig, the local council where FDM head-honco Aki Nawaz and many a man from India, Bangladesh and Pakistan live, has embarked on a program to highlight the ‘nastiness’ of spitting pan, the equivelent of chewing tabacco. 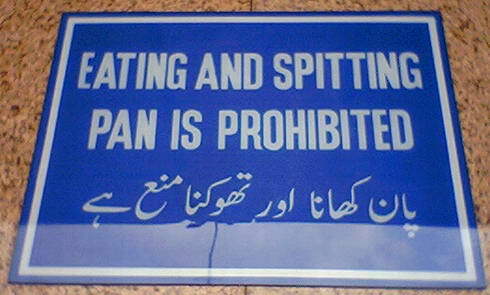 Anti-pan spitting propaganda competes with the beautiful sari’s for your attention. A day after returning home, the “King of Ghetto-Tech” Maga Bo came to Tenerife on his way to the Fuerteventura en Musica festival. 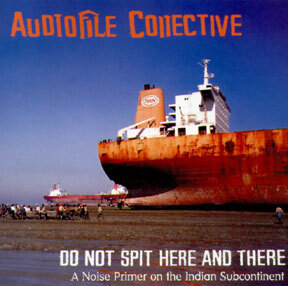 One of the digital gifts he dropped on me was the Audiofile Collective’s ‘Do Not Spit Here and There‘ project. If you’ve never been to the Indian sub-continent, this CD is a very good Lonely Planet audio guide. If you have been to the Indian sub-continent, it’s a very good audio photo – field-recordings of prayer calls, dhols, traffic horns, markets, radio scans, airplanes, discussions, cinema audiences and the like neatly mixed, like twenty-four hours compressed into 30 minutes, Chris Watson style. A healthy portion of ‘Do not spit here and there’ take up the opening of todays program. The Kominas, with whom we shared the Meltdown festival stage come in with their edgy take on matters. As usual, being in London meant meeting up with Kevin ‘The Bug’ Martin at Sounds of the Universe, before it was ‘tart o’clock’. At Sound…we delved into re-pressings of Ruddy & Redeye Original Sounds 7’s, like Wayne Marshall’s Gunshot, and Errol Bellot’s What A Wonderful Feeling. I also picked up one of the first tunes I recall, U-Roy’s ‘Welding’. Tody’s program also opens it’s doors to The Dead Kennedys’ Kill The Poor, Cutty Ranks, Kode9, an exclusive from Adrian Sherwood featuring Congo Ashanti Roy and the late Mikey Dread inna bass-heavy drop – Blackanized from Glasgow with ‘What a G’waan?’; Ricky Ranking with his first outing for Roots Manuva’s Banana Klan label….oh speaking of Roots Manuva, The Bug gave this head a blast of a couple tunes from the version album of London Zoo, and yes, finally the long desired pairing of Roots and The Bug will come out soon. Oh check this too, Public Enemy remixed by The Bug. Yeah, that’s right, now your panting like the cats outside my house that are in serious heat. Also kicking the stuffing out of weak speakers is Timeblind with the environmentally sound Rastabomba, giving a discourse on the use of solar panels and other The Man trick you to using dere tings when all the goodness is here all about, and how dem/we pollute all de wata, unnastand?